Leading up to the 30A Songwriter Festival, I tried to listen to as many of the artists as possible. That challenge was made even more critical when the Beachcomber asked me to review a handful of artist’s albums for editions leading up to the big event. I completed the task with one giant thought: the talent of 30A Songwriter Festival is overwhelming, impressive, and more varied than I initially expected. Sometimes, it just takes a few minutes of music and this feeling takes over – it is akin to falling in love. It is instant. It feeds some part of you. And you know you are now a fan. 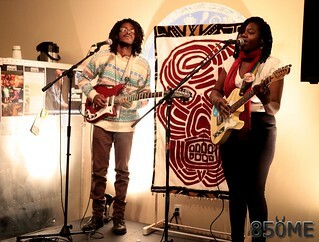 That is what happened with Kazoots – a band from Miami with roots in Haitian music and culture. I had to know more about them, so I set up an interview. Through that, I got to know the band and understand their musical hopes. Along with that interview, I am happy to pass along that seeing them live was just as magical as I had hoped. Inez owns the stage. With bare feet and one of the most unique voices I’ve come across in a while, it was an absolute treat to see them perform. Kazoots is comprised of Inez Barlatier (rhythm guitar / vocals), Jayan Bertrand (lead guitar / backing vocals), and Gabe Norwood (drums). The seeds of Kazoots were planted before either Inez or Jayan played instruments. “Jayan and I grew up together, because our parents were in a band together in the 80s,” explains Inez. Even the name Kazoots is an ode of sorts to their parents’ band – Koleksyon Kazak. 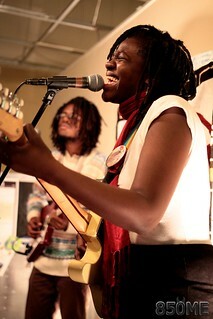 “We usually call it afro-indie-rock – or the acronym AIR,” explains Jayan of their original style. Jayan: Just touring – I love traveling. I want to travel more. To be able to play music – which is the only thing I basically live for, to be able to travel and play music at the same time… It is just beautiful. It is the best of both worlds. Gabe: I would like to see the band really solidify itself. I’m speaking truthfully – these two have been in Miami for a while and I am from DC and moved down here recently. . These two haven’t been congratulated in the city as much as they should. Inez: I know it will take a while, but for me I’d like to create something that hasn’t been done before. Even if it is a fusion of styles that were separated before. I want to make music that has never existed before. If I can accomplish that then I would be a happy person. Be sure to give the band a listen – you may soon be craving AIR too. This entry was posted on February 11, 2014 by 850music in Posts and tagged 30a Songwriter Festival, Interview.